Fasten your seatbelts, gentle readers. 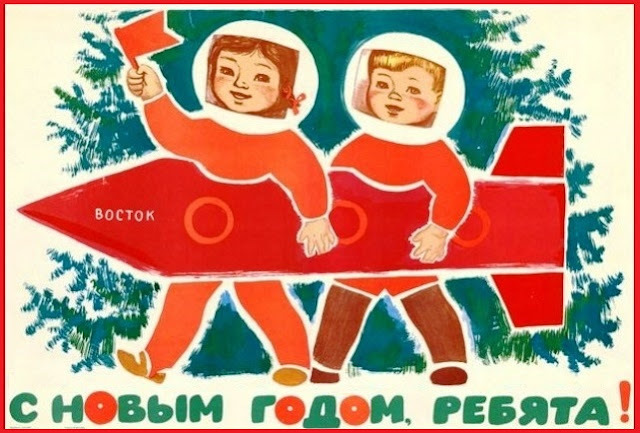 We're blasting off for another wacky Saturday blog, looking to achieve escape velocity and set a redoubtable course for the final (imaginative) frontier... space is the poetical place. As an English boy in the 1960s I was quite thrilled by the record-breaking heroics of the early Soviet cosmonauts. I suppose I might have taken a different view if I'd been born an all-American kid. Yuri Gagarin (aboard Vostok 1) was the first man ever to go into space, a feat he achieved in April 1961 nearly a year ahead of his US counterparts. A hero of the Soviet Union (and a man with a serious drink problem), Gagarin died in a terrestrial test-flying accident later in the decade. Valentina Tereshkova was the first woman ever to go into space (aboard Vostok 6) in June 1963. In fact she remains the only woman to have undertaken a solo space flight. A heroine of the Soviet Union, she is still alive and in 2013 (aged 76) volunteered to go on a one-way mission to Mars should it happen in her lifetime. What a girl. What an ambassador for gender equality. When I was working in Russia a few years ago I tried to visit Star City (Zvyozdny Gorodok), home of the Yuri Gagarin Training Centre for aspiring cosmonauts (recently demilitarised though still not on many maps); as it turned out, a bit of a bleak adventure into a retro-Soviet hinterland, at odds - not unsurprisingly - both with all the romanticising propaganda that surrounded the space race of the 1960s and also with the emerging post-glasnost/ perestroika Russia. It's a curious but not unpleasing paradox (at least it seems so to me) that as we have voyaged deeper into the atomic age and as our scientists made more and more astounding discoveries about the true nature of the omniverse, we have clung to our basic tendency as human beings to mythologise, to incorporate hard science (jet propulsion, space travel) into our fondest make-believe. When peace on earth and goodwill to all men seem as far out of reach in the 21st century as they have ever done (despite all of the technological progress we have made as a species), it is mildly reassuring at least that the ideal lives on in cultural and political initiatives (and Russian Christmas cards and Disney animations). "War is over if you want it!" (Lennon/Ono, Christmas 1971). It was on this day (8th December) in 1980 that we woke to the sad and shocking news that John Lennon had been shot dead in New York City. Crazy, crazy - animals with guns. I watched a documentary about him and the making of his 'Imagine' album on tv the other week and it feels only appropriate to borrow one of his lines as the title to this strange new poem, informed by my weekly musings. in the grey October of our borning. and the gassing of babies is okay. wondering what's it all for? but the words hold no magic anymore. fills us with mighty dread. and smiling wave the earth goodbye. If you're in the mood for mince-pies and live poetry, Lancashire Dead Good Poets' collective is holding its December open mic night on Thursday 13th at the Jazz Emporium in St Annes (see the sidebar for details), when we'll also be launching our latest anthology, 'The Big One'. Be there or be square, qouth the quipster. TBH not sure what to make of this. It's interesting and beautifully written but a bit negative? Or is it ironic that your cosmonauts just decide to pull the plug? Confused of Terra Firma! An interesting blog. I love the retro space art and thought your poem was intriguing. Steve your blogs are always a treat to read. This was no exception. I loved the illustrations and I thought the poem was clever and neatly done.Merry festives to you too. That's a fine poem. Have you seen the movie Dark Star? Great black humor. Love the blog Steve. Merry Christmas to you. Yay. Very good. I'm sure John would have approved. I remember we had a trendy student-teacher for one term back in the mid sixties and we were allowed to do project-based learning, a real breath of fresh air. I was in a group researching the Space Race, reading about it, writing about it, making model space ships out of loo rolls, tin foil and the like, painting pictures, writing poems and such. Your blog has brought it all back to me. Nice one Steve. There was more mystique and romanticism attached to those Soviet space exploits and it looked like they led the way for a while - probably a lot of stage-dressing as it turned out. I enjoyed the concept and composition of your poem - very good. Merry Christmas to you. Really like the new poem. Its strangeness is its charm. And I always thought Santa Claus was the first man in space! Enjoyed this, very well written. Great blog. Merry Festives reciprocated. - the 'going rogue' concept is just an imagined response taken to the extreme; wouldn't those cosmonauts sometimes be tempted to think 'f*ck it, let's just leave Earth to it'? 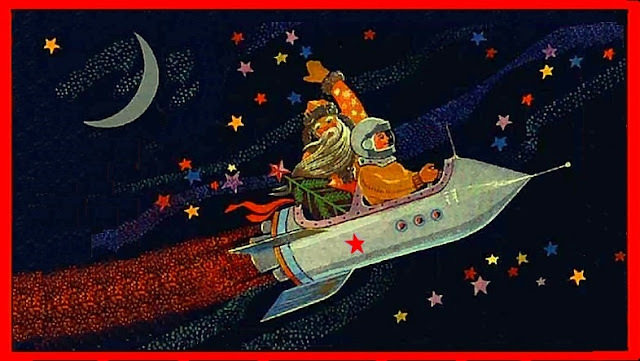 - Santa Claus was never the first man in space, definitely only sub-orbital. He only ever flies at a few hundred feet. He and the reindeer (which are colour-blind incidentally) need their oxygen. - coindidentally Peterborough, where I went to primary/junior school in the 1960s was unusually cosmopolitan - as I've blogged elsewhere - and there were both Americans and Russians living in my neighbourhood (the former families linked to the US airbase at Alconbury, the latter asylum-seekers from post-war USSR). In fact my dancing partner at junior school was Tamara Shevchenko and that's the first time I've thought about her in fifty years. There they were - gone! Terrific poem. Peace and Love at Christmas. Top seasonal blog. Merry Festives back to you. What a great blog - love it. Thank you and Merry Christmas. Enjoyable and entertaining as ever Steve. I really likes the poem. Merry Christmas, Happy New Year and keep writing. God I love these Saturday blogs - great writing. Coincidentally we've all just sat through Apollo 13 on TV - what a gripping movie about NASA's "most successful failure". It just brings it home to you how brave the astronauts and cosmonauts are to risk all in their endeavours. Merry Christmas to you and let's wish for Peace on Earth, however elusive it appears. This blog is very timely because at Christmas exactly 50 years ago Apollo 8 became the first manned mission to leave earth orbit and to fly around the moon and back (December 21st to 27th). It was the first launch of Saturn V and astronauts Anders, Borman and Lovell helped put the US ahead of the Soviets for the first time in the space race. That was a cool read. Thank you. Great blog and poem. Loved the graphics as well. Cool. That's a fascinating blog and one hell of a good poem. Terrific, thank you. Christmas/New Year seems to be a popular time to go visiting. I hear the Chinese have just landed an unmanned explorer on the 'dark' side of the moon. Top blog. Lucky you having had the chance to work in 'mother Russia'; must have been interesting. I thought your poem was very powerful and such a great conceit - imagine just cutting loose. A nice tribute to the great John Winston Lennon as well. Thank you. But you won't fool the (Grand)children of the Revolution" - ain't no disPutin' Mr Bolan. A most intriguing blog: affection and disaffection in equal measure. I agree with the first commentator - brilliant. Such a pleasure to read. Great blog, entertainingly written, beautifully illustrated and I loved the quirky poem. A nice touch to remember John Lennon's anniversary. Well done. I thoroughly enjoyed this. I envy you your imagination and way with words.